Keeping your house comfortable, regarding both temperature and light, is made easier with window sunscreens. We make custom sun screens featuring a dense weave of fiberglass and polyester from Phifer SunTex®. This material reflects and dissipates up to 80-90% of the sun's heat and glare. 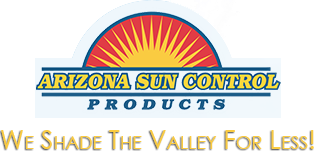 Framework, screen work, and rescreening are among the core services offered by Arizona Sun Control. Our frames are heavy-duty, made with baked-on enamel finishes in black, gray, white, beige, brown and dark bronze colors to choose from. You'll start by meeting with one of our professional sales people to discuss your options and what you're needs may be for window sun screens. They'll explain your options, help you choose the right option, and measure the windows to create your new sun screens. You can even get pet-resistant screens to protect your windows and doors. Our fiberglass or polyester sunscreens are an incredibly effective heat reduction solution and can complement any style of home. They are dense and durable. We have a large selection of fabrics and colors to choose from.